Interplay's Fallout MMO might have been nuked into oblivion by a lengthy legal battle that Bethesda ultimately won, but that doesn't mean all hope for massive scale wasteland shenanigans is lost. FOnline: Ashes of Phoenix is a free fanmade Fallout MMO coming next week, and it certainly looks the part. Ashes of Phoenix is set to release on September 5th, but it's not the only fanmade Fallout MMO on the block. Not by a long shot. It uses the FOnline engine, which also serves as the backend for games like FOnline: Reloaded and FOnline 2. All these games are from different teams, so each one differs in key ways. A new region of the Fallout world to explore around the city of Phoenix, a giant location with dozens of connected quarters where everything can happen. An advanced system of factions and reputation, including private bases for player platoons, merchants, assignments and more, regrouped inside faction headquarters where you can rest between missions and meet new mates to explore the Wasteland. A completely reworked character system with hundreds of viable profiles, guarantying that you can actually create any character you want and develop it on the long term, while still being competitive against other players. No level cap, but a soft cap at level 24, where evolving your character further will make it rather more versatile than strictly more powerful. A deeply revised combat system fully in real time with the introduction of a new Action Points system, new burst mechanics, deployable weapons, covers, squads and many more features implying personal and group strategies for an exciting and ruthless combat experience. A strong PvP system stimulating fair savage PvP and involving the control of Phoenix. Twelve quarters can be claimed, strategy and smart moves matter more than ever. Exploring Phoenix underground dungeons can also be the occasion for player groups to ambush each other. A huge diplomacy potential with the presence of four main factions: Jim & Jack & Joe Lawyer Agency, the Family, the Brahminboys and the V-Technologists. Player platoons will deeply influence the diplomacy of their faction. A vast equipment composed of hundreds of weapons and many armors. Multiple new items have been added, like new grenades, traps, spears, energy SMGs and many more. Those items bring a new dimension to PvP, like smoke grenades, Incinerators or the legendary Bozar heavy sniper rifle. Every player should find multiple suitable combinations of weapons and armors for his playstyle. A vast crafting system including the search for relics, exchanged with your faction for blueprints unlocking more advanced weapons through different tech trees. Your character is able to be fully independant without suffering from any power gap with other player characters. A strong economy based on player trades, smart scavenging and crafting where bottle caps and equipment in general are more difficult to stockpile. A completely new interface optimized for PvP including a new Pipboy, called the Cheapboy and working both as an intel provider and an encyclopedia. Enhanced NPCs for a more natural and dynamic experience. Raiders roam the ruins of Phoenix, packs of wild animals are out for blood in the Wastes and friendly travelers might come to your aid. You never know what's hiding behind the next corner. A maximal randomization makes sure every journey in the Wastes is a new experience. Loots, mobs and even assignments you can get from your faction will lead you to new places and situations in which you have to adapt and quickly react. A mini-adventure tutorial will introduce some of the game mechanics and give you the occasion to play safely on your side before joining the actual game field. So basically, it's a big faction-based player-vs-player MMO full of exploration, quests, NPCs, crafting, and the like. It's not your typical Fallout experience, but it sounds like there could be a lot of room for crazy player-driven stories and emergent zaniness. 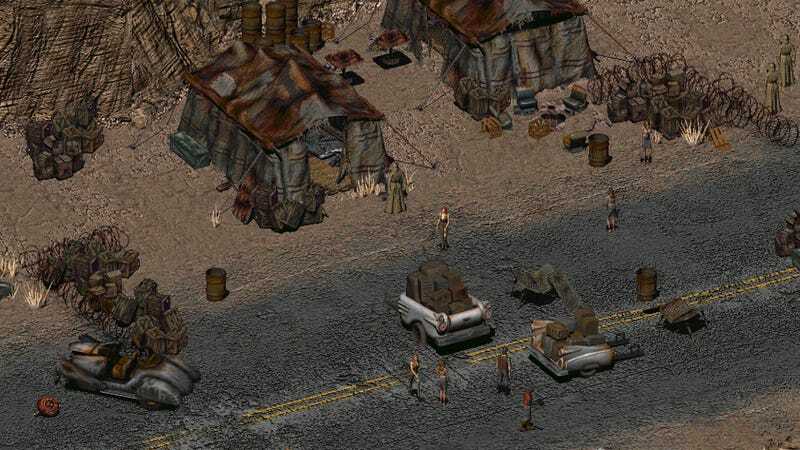 You'll need a copy of Fallout 2 in order to play, but otherwise it's completely free. I haven't personally played any of the FOnline games, so I can't vouch for their quality. Here's hoping this one is good, though. It sounds madly ambitious, if nothing else. But honestly, I'm a simple man of simple needs. Give me a tastefully irradiated open field, a two-headed cow, and a frighteningly large rifle, and I'll be set for life. Or at least until someone kills me and eats my cow.